There was some good news at the weekend for British fans of 2010’s animated film, How to Train Your Dragon, as the TV spin-off arrived on the Cartoon Network. Dragons: Riders of Berk picks up a short time after the events of the Dreamworks film, when (and this is a spoiler if you haven’t seen How to Train Your Dragon) the Vikings of Berk and their dragon neighbours are living in harmony. Well, as harmoniously as can be expected when you’re talking about flying beasties that breathe fire. Now it’s up to the humans to stop killing the dragons and train them to help them in their daily chores, with the first double bill of episodes neatly reminding fans what had gone before while informing newbies what they’ve missed. The young voice cast from the film has been retained for the TV series, including Jay Baruchel as lead Hiccup, while the adult actors are now Americans pretending to be Scottish as Gerard Butler and Craig Ferguson are off doing bigger things. Thomas Wilson (Biff from the Back to the Future series) is Bucket while ex-Doctor Who David Tennant is also due to pop-up in a future episode as Spitelout Jorgenson, recreating his role from the movie. The series retains the computer generated look of the feature film and much of John Powell’s terrific score, a soundtrack I’ve been listening to regularly for a few years now. Composer John Paesano joins the series for weekly scoring duties. Two seasons have been commissioned and 40 episodes are in the works, with season two to be called Defenders of Berk. Season one began in the US in August 2012 so we’re a bit behind, but judging by these first episodes it’s a programme worth sticking with and I can’t wait to follow the adventures of Hiccup, Toothless and co.
We’re also promised two new feature films in 2014 and 2016, meaning the How to Train Your Dragon franchise should be a long and fruitful one, something worth celebrating in this world of soulless sequels. 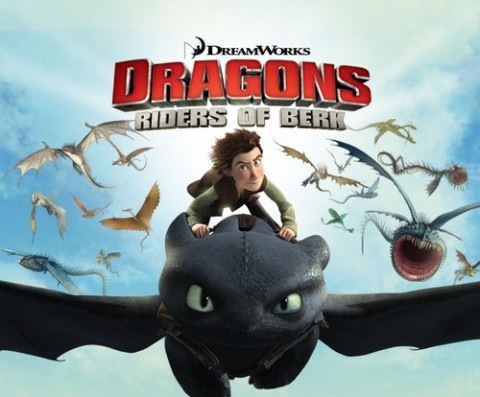 Dragons: Riders of Berk airs on the Cartoon Network on Saturdays at 10.30am and 6.30pm. With the new series of BBC Three’s Being Human just a few weeks away, the publicity machine is slowly cranking into gear with the release of a new promo image (above) and trailer. The trailer tells us nothing about the actual content of series three, but we know that the team have a long way to go before they’re back to normal (well, normalish) after the traumatic events of series two. I know, I know: never judge a book by its cover (unless it’s a Dan Brown novel in which case you know to avoid it) and never judge a US remake of a UK TV series by a 90 second preview. I know the rules, but I’m still going to state that my first glimpse of Being Human USA doesn’t fill me with confidence. Being Human has been one of my favourite shows of the last few years, the story of the vampire, werewolf and ghost flatsharing in Bristol a real oddity in the BBC 3 schedules, mainly because it’s good. Earlier this year I carried out a fairly pointless yet still pretty enjoyable blog-a-thon of the first series and I also started previewing some of the second series, which I may try again in 2011 when the third comes along. Now, following in the footsteps of other great transitions of UK programmes to America, Red Dwarf and Coupling two which spring to mind (and something called The Office which has done OK), the BBC are sending the format of Being Human Stateside, with 13 episodes of the retooled show due to air there in January. The downside of this is that original stars Aidan Turner, Russell Tovey and Lenora Crichlow won’t be reprising their roles of Mitchell, George and Annie. Instead, Sam Witwer will be appearing as vampire Aidan, Sam Huntingdon will be the werewolf, Josh, and Meaghan Rath will be the ghost, Sally, with all the action relocated to Boston. Though the UK version had a pretty substantial creative team, Whithouse deserves some major credit for shaping the series. Without him are we only going to get a knock-off, albeit an expensive knock-off, of the parent programme? The first clips are now online and don’t look that promising, the kitchen scene looking like a rehearsal for the final shot and a few fast cuts suggesting it’s going to be a flashier programme. Again, you can’t really judge the first episode on a few clips, and I’m still not sure if I’ll actually watch the American version or stick with the original. Keep an eye on the excellent BBC Being Human blog for more updates on the third series of the original Being Human. Who doesn’t love a good cartoon? Thanks to /Film shouting about it, I’m pleased to present the latest Road Runner animation from Warner Bros, which appeared in cinemas over the summer. Hopefully we’ll be seeing more of these at the cinema over the next few years as we all need cheering up after the 30 minutes of adverts and trailers which clog up a film’s running time these days. Nothing’s forgotten, nothing’s ever forgotten. That’s the case for fans of the most original telling of the Robin Hood story, 1984’s Robin of Sherwood, which now receives a welcome re-release on Blu-ray and DVD following extensive restoration work. For the last 26 years viewers have been revelling in the adventures of Robin of Loxley, aka Robin i’ the Hood, as portrayed by Michael Praed in Richard Carpenter’s version of the legend which this time weaves magic and paganism into hour-long stories of derring-do. Robin is the sole survivor of the village of Loxley, who finds himself England’s best hope against the corrupt authorities, led locally by the Sheriff of Nottingham (Nickolas Grace) and his often bumbling right-hand man, Guy of Gisburne (Robert Addy). Among those aiding Robin are the hard-nut Will Scarlett (Ray Winstone), gentle giant Little John (Clive Mantle), the simple-yet-loyal Much (Peter Llewellyn Williams) and Friar Tuck (Phil Rose). This time around there’s a new addition to the team in the shape of Saracen assassin, Nasir (Mar Ryan) and, most importantly, the figure of Herne the Hunter (John Abineri), a pagan god given to appear in human form when his help is needed most. Topped and tailed by the somewhat epic Swords of Wayland and The Greatest Enemy, these Boys Own adventures manage to remain fresh each week, despite the unavoidable fact that the Sheriff always has to lose. Or does he? Robin may have been screened in a teatime slot on ITV, but its makers had always aimed for evening showings, meaning there’s a darkness and adult feel lacking in other Robin Hood series. Death hangs heavy over the programme, evil and spiritualism never far from scripts which would otherwise be straightforward teatime romps. Inevitably there’s the odd misfire, the first season’s Alan a Dale not the most inspiring story, while second season episode Lord of the Trees is hampered by having too much ambition and not enough time to do the story justice, but otherwise there’s a fantastically strong run of episodes in each series. Intrinsic to Robin of Sherwood’s success is its sumptuous look, the standard set early on by director Ian Sharp as the forrest is bathed in a dreamlike haze, where it’s always summer and shafts of light are forever piercing the woodland canopy. Finally, there’s the music from Irish folk rock group, Clannad, their use of both traditional and modern instruments, as well as recurring songs and character themes, adding yet another layer which rewards loyal viewers. For anyone who has invested in previous versions of the series, whether on VHS or DVD (or in the case of this reviewer, both), be aware that this isn’t merely a repackaging but a whole new proposition from Network DVD. While the DVD made the episodes appear as if they’d been shot through a thick mesh, this time everything appears crystal clear. Extras here are mainly ported over from the previous set, the commentaries, from various members of the production team, offering a valuable insight into the making of the series. There are also some in-depth documentaries featuring the cast which cover series one and two and an extended version of the Grampian-made Electric Theatre Show documentary present on the first release. Robin of Sherwood is available now from Network DVD. Opening with the blisteringly fast-paced The Eleventh Hour and closing with the timey-wimeytastic The Big Bang, the fifth season of the reinvigorated Doctor Who is an exhilarating romp through space and time which you won’t find anywhere else on British TV these days. It was less than a year ago that the world was introduced to the latest incarnation of the Doctor, as number Ten vacated the Tardis for failed US drama pilots and a movie career and number Eleven stepped into his plimsolls. Matt Smith makes for a gangly, old-before-his-time version of the Time Lord, a fusion of Troughton, Davison and perhaps a dash of Tennant as he takes on the multiverse with new companion Amy Pond (Karen Gillan), a flame-haired stripper from Scotland with a penchant for short skirts and one-liners. The new Doctor’s crash-landing in the village of Leadworth in the first few minutes of episode one, and his encounter with the young Amelia Pond (the brilliant Caitlin Blackwood, who deserves her own spin-off), leads to an hours worth of perfectly-pitched drama which could be the most enjoyable slice of telly we’ve had in 2010. From here, it’s into deep space, back in time for meetings with Vincent Van Gough and Churchill (not to mention a few Daleks), and onto present day England for a spot of footie and a meeting with more foes from the Doctor’s past. There are also return appearances for mystery woman, River Song (Alex Kingston), and the Weeping Angels in two-parter The Time of Angels/Flesh and Stone, a bleak adventure penned by Steven Moffat, who writes six of these 13 tales. Throw in the presence of a fiancé for Amy in the shape of Rory (Arthur Darvill), who dips in and out of the series, and an ongoing plot thread revolving around a crack in time, and it becomes hard to believe that, apart from episode one, these are only 45 minute episodes. Expertly pitched at a family audience, there are few duff notes in these episodes, though the logic of spreading key plot points across seasons is curious one. There are a few occasions when seemingly important ideas are raised but not resolved, The Lodger being one where a rewatch still leaves questions unanswered. Making the most of its tight budget, with impressive FX and sets, and a musical score from composer Murray Gold which will have you snapping up the soundtrack album, this is a nifty package that demands your attention. 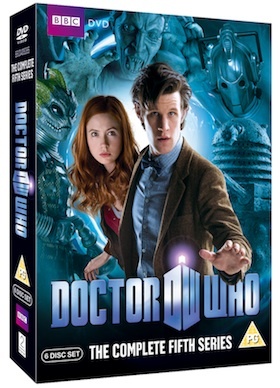 Available as a DVD or Blu-ray set, the package comes with six in-vision commentaries from various members of the cast and crew (though quite why we don’t get 13 is a mystery), as well as some newly filmed linking sequences between episodes and video diaries from Karen Gillan and Arthur Darvill. Thirteen cut-down Doctor Who Confidentials are awarded their own disc, offering insight into the making of the relevant episodes.